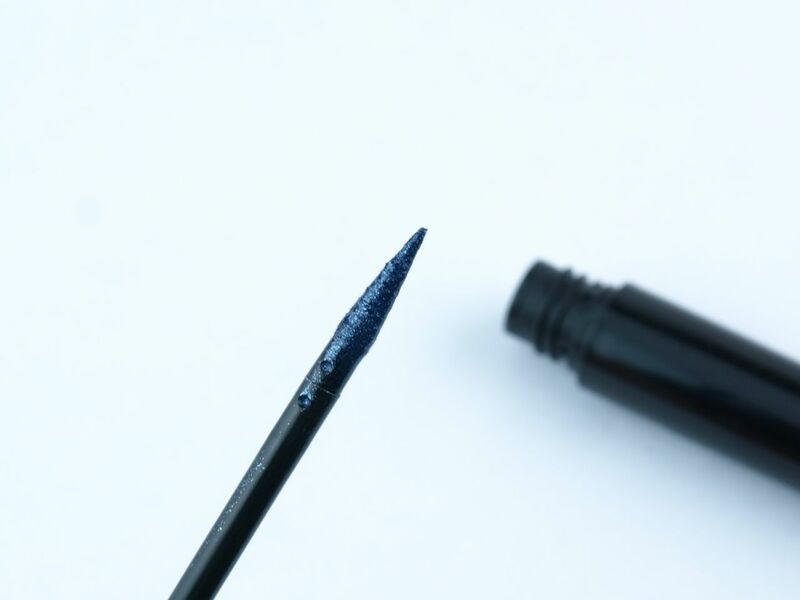 The Metal:Ink liquid liners come in simple black pens with a snap-on cap that tightly seals the product. The pen has a color bulb on the top of the cap and a colored stripe on its handle to indicate the shade. The applicator is a thin, tapered felt tip. I really like the design because it has enough stiffness to allow controlled strokes which means cleaner lines. 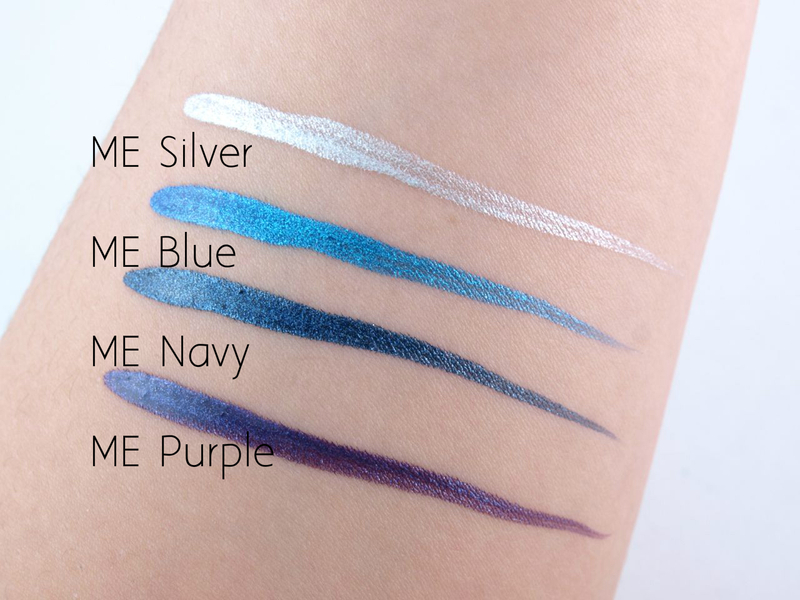 The Metal:Ink Liquid Eye Liner features a waterproof metallic formulation. 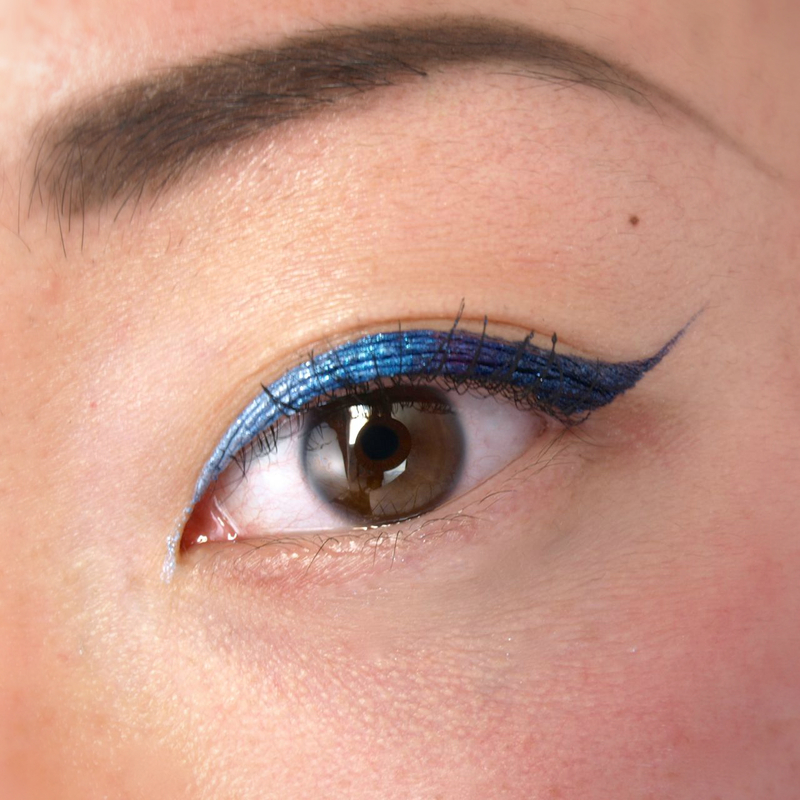 Inspired by Hanabi (the Japanese word for fireworks), these colorful liners have a mostly non-aqueous polymer formulation that doesn't budge when wet. Packed with shimmery metallic particles, the liners are super opaque and intense. The formulation is fairly fast-drying and it literally lasts all day with no smudging. There is very minor flaking throughout the day, but they are tiny miniscule flecks that can be wiped away easily, leaving behind no smudges. The liners come off very easily with some Shu Cleansing Oil. ME Silver: This is a very pale, almost white silver. The formulation of this one is the sheerest of all four that I have swatched here, but it's still quite good. ME Blue: A unique blue with a subtle purple duochrome effect. Super pigmented! ME Navy: Intense dark navy blue. ME Purple: Dark purple. Again the formulation of this one, like the previous two, are really amazing. The liners can be easily blended together. I tried to do a gradient with the colors. It looked really perfect until I added in the purple, which didn't really fit the "Frozen" Elsa color scheme as well as I thought, haha. I love these! 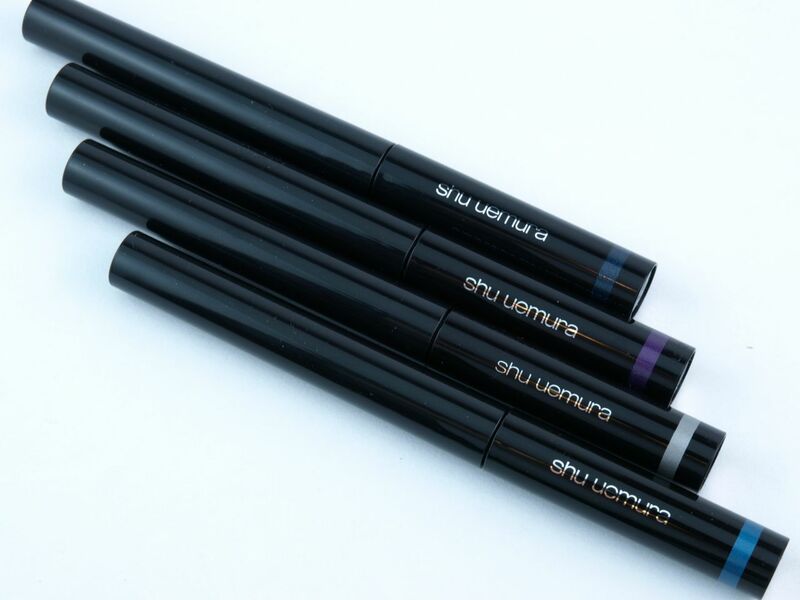 I think it's pretty hard to find very long lasting and pigmented color liquid liners on the market and the fact that these Metal:Ink Liners from Shu Uemura comes in 10 different shades (even a bright red and a fresh green) makes the line even more amazing. These are 100% waterproof and smudge-proof and I've only experienced minor flaking. If you love colored liners, definitely check them out! 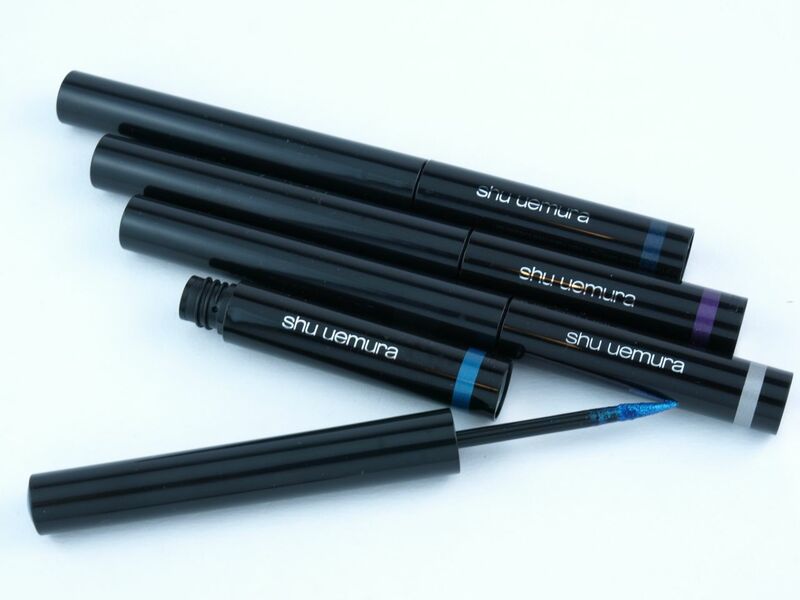 Shu Uemura is available online and in stores at The Bay, Sephora, and Holt Renfrew.